7 nights - 6 days independent walking moving between guest houses. 7 nights accommodation in several charming hotels (mainly 3 star) and guest houses in double or twin rooms with own bathrooms. A variety of styles with good hospitality and comfortable accommodation throughout. Transfer at the end of your holiday from Aber Wrac'h to Brest train station. 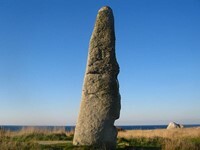 Your self-guided walking holiday takes you along the northern Finistere coast in Brittany heading west from Rocoff. This independent holiday ends in Aber Wrac'h after 6 day's walking, but we have a second part which continues west, reaching the most westerly point in France before heading to Brest. The coast of Legends in Brittany has a thousand different faces, including dramatic cliffs, beautiful beaches, sand dunes and stretches of pebbles. The long estuaries or Abers create wide breaks in the coast. These start at the end of part 1 when you go around Aber Wrac'h. There are a number of small resorts and villages, inbetween which are long stretches of wild and unspoilt coast. 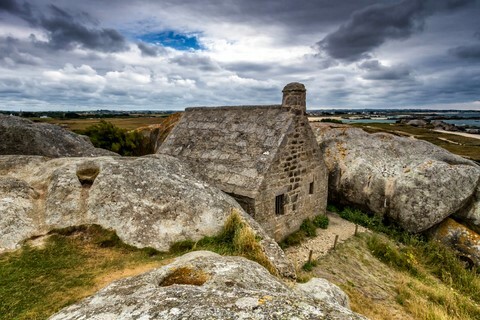 One of the most striking features of this section of Brittany coast is the multitude of tiny islands and rocky promontories which make this coast so difficult to navigate, making it a place of numerous shipwrecks and legends. Another feature of the coastline are the pre-historic sites with burial chambers and standing stones adorning the landscape. 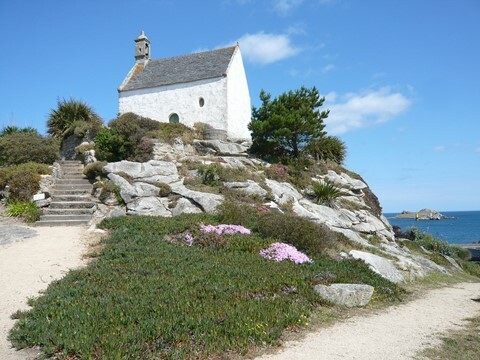 Walks on this self guided holiday in Brittany are on an undulating coastline alternating between easy and moderate walking, with distances varying between 16 & 22km per day. The average amount of ascent and descent in the day is 200m and the maximum is 350m. The average distance however is relatively long at 20km. Some days feel harder as they constantly rise and descend, and so it is harder to find a rhythm. The paths are well maintained and for the most part are well sign posted as you are following the long distance GR34 coastal trail. Arrive in Roscoff by train or ferry. 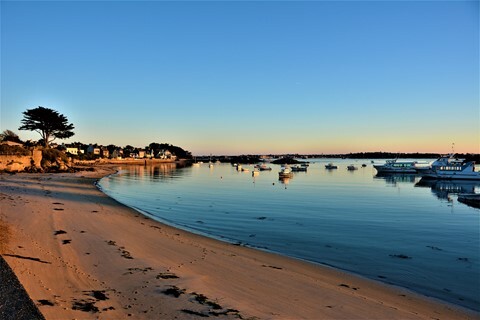 Explore the historic town of Roscoff. 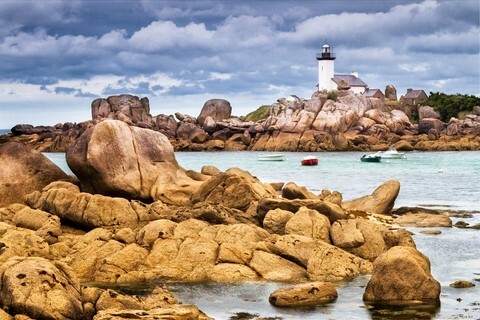 Possibility to take boat trip to island called Ile de Batz. Transfer to Brest train station after breakfast. Possible to book additional nights in Brest. 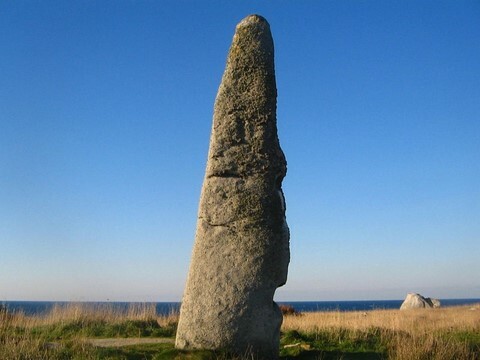 Possibility to continue with part 2 of our Legends Coast walking holiday in Brittany which goes from Aber Wrac'h to Conquet or Brest. Mainly charming and friendly 3 star hotels on this Brittany walking holiday in France. Very comfortable accommodation. We leave you the choice of restaurants and/or menus on many nights so that you can manage your budget. One or two nights in a lovely B&B in Guisseny. Good hospitality and comfortable accommodation throughout your stay with ensuite rooms. Tasty regional cuisine. Below you'll find examples of the different types of accommodation we use. Montevella, Guisseny Guest house Montevella is a charming old guest house within a large walled garden in the coastal town of Guisseny. It was originally built as a presbytery in 1894, but has just undergone careful restoration and modernisation, retaining all the character of the original house, but with all modern comforts. There are four large luxurious double bedrooms. Heated swimming pool. 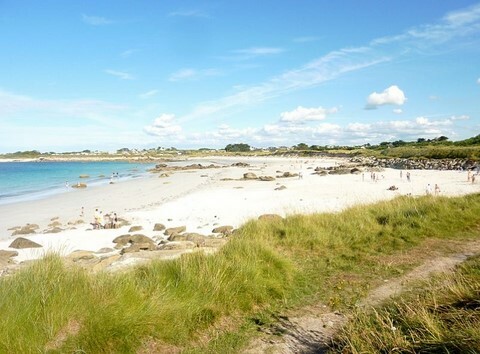 Make your own way to your first hotel in Roscoff. The hotel is in the historic town centre about 1.5km from the ferry port. We can book transfers from the ferry port if required. Brittany Ferries run boats from Plymouth to Roscoff in Brittany. If you arrive by car, there are long stay car parks in the town which are free of charge, listed below. Eurostar and the TGV run trains from London to Paris where you need to change and make you way to Paris Montparnasse. Take a train to Morlaix and then change for Roscoff. Direct flights to Brest from Southampton and Birmingham during July and August with Flybe and from London Southend from April with Ryan Air. 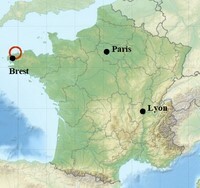 Transfer to Brest included in holiday price. Trains to Roscoff, Rennes and Paris via Morlaix. See above for flights. Transfer to Roscoff from Aber Wrac'h is possible for a supplement.